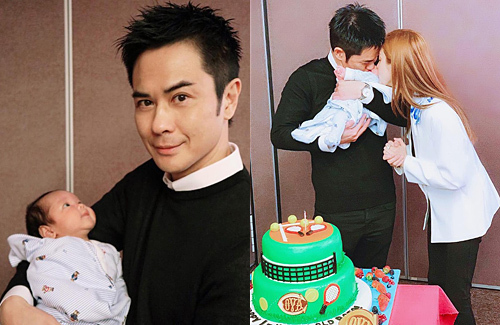 Grace Chan (陳凱琳) and Kevin Cheng (鄭嘉穎) tied the knot last August and welcomed their baby Rafael in February. It has already been a month since Rafael’s arrival and the Cheng family recently celebrated his one-month birthday. The couple happily share this occasion with family portraits on their Instagram. The couple’s friends such as Eliza Sam (岑麗香) and Sharon Chan (陳敏之) were excited to see Baby Rafa’s photos and sent their best wishes. Thoroughly enjoying his new role as a father, Kevin has taken time off from work since his son’s arrival. He stayed home to help out Grace, who has recovered quickly and made a public appearance just two weeks after giving birth via Cesarean section. 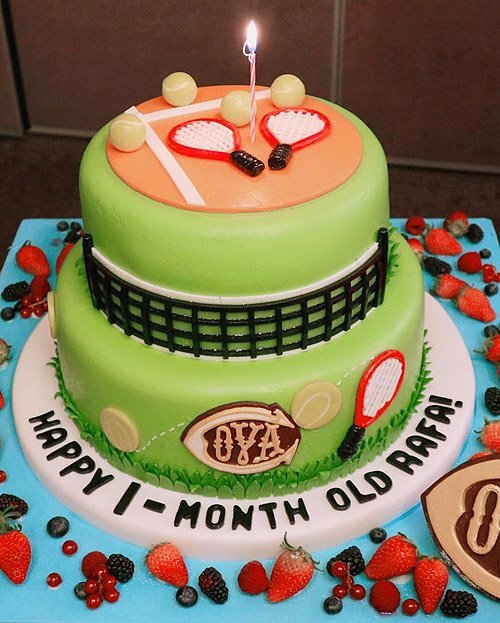 A pity.Kevin went out of his way to design a tennis themed cake, it just looks like a cheap icing cake you can get out of a local supermarket chain…. @jimmyszeto I was about to say the same. That’s a pretty ugly looking neon green cake. It looked like they tried too hard with the tennis theme and failed.. It wasn’t tastefully done and looked like random items stuck on the cake. COVA is a high end coffee shop. They might have sent it free of charge (knowing that Kevin loves tennis). My friends and I guessed that they named their son after Rafael Nadal! Baby Rafa is so cute looking up at Kevin like that. He is going to be a good father. I like the little touch of having a clay court on the cake to honor the best clay court tennis player ever. Baby is thinking “that must be my grandpa”……..
@passingby2 LOL. But the baby is really cute, though. As expected from this couple. 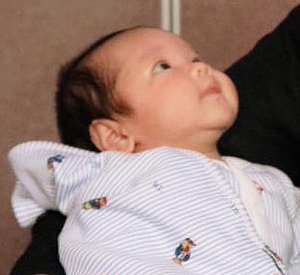 Baby Rafael is so cute staring at his Daddy at his very young age (1-month old only). Usually babies sleep most of the day. How adorable. It seem like Rafael is going to have a big ear when he grow up. The baby’s cheeks and eyes’ expression looks so much like Grace. The way he looks at Kevin is how I imagine Grace looks at him, too lol. Just kind of puppy-eyes and idolatry.